Thomas G. Kavanagh was born on August 14, 1917, in Bay City, Michigan. He attended the University of Detroit High School and received his A.B. degree from the University of Notre Dame in 1938. Kavanagh then attended the Detroit College of Law and received his LL.B. in 1943. 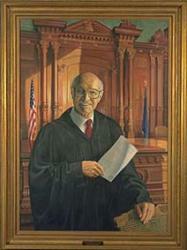 Kavanagh’s career as a judge began in 1964, when he was elected to the Michigan Court of Appeals. His career advanced in 1968, when he was elected to the Michigan Supreme Court. In 1976, the Democratic Party nominated someone else. But with overwhelming support from the State Bar and the general public, Kavanagh won re-election by a landslide. Kavanagh was fond of saying that “the members of the Court through sheer happenstance and the vicissitudes of politics, ambition, age, health, and geography had been thrown together like survivors sharing a single life raft, and it was our task and our duty to work together for the common benefit.” He demonstrated that spirit of cooperation in a thousand ways through his long and productive judicial career.